Laira: "Dad, one day I'll be as brave as you! I'll be as great as you! I'll be a true leader and commander! I won't disappoint you, I promise!" 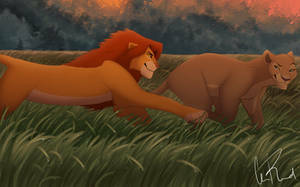 Kion: "I have no doubts, my little general. You'll become even greater than me! " I watched a few series of "Tangled" and was inspired by Cassandra who wants to be like her father. So, Laira admires her father, the Leader of the Prideland's army and the Lion Guard the great General Kion. She really looks up to him and wants to be like him. She has taken a lot after him. However, Kion knows that his daughter is going to be something more than the general, as she's is betrothed to the prince. P.S. I've changed all of my fan theory a bit if not to say that completely. If that's Kion, where is the mark of the "Lion Guard"? is he no longer in the Lion Guard and now a father? I like the picture anyway. I just haven't learnt how to draw the mark yet and don't want to reference it or draw it in a wrong way. He is the Lion guard's leader and also the General. She looks exactly like Nala. Kion would DEIFINATELY look like how you've done him! I must say !!!!!! People always try and draw him and stuff as an adult and personally I don't think it really suits him, but this does! And who's the mom ? Could it be Vitani , Tiffu , or Zuri . Actually, she's Kion's adopted daughter and her real parents are unknown. Originally Laira was going to be Kion and Zuri's daughter but it meant she was going to marry her cousin, so I decided to make some trick to avoid that kind of thing. I keep thinking about Zuri's connection with Kion and Laira. She's the one I ship Kion mostly with. So, if I finally decide that Kion marries Zuri it means she would be Laira's adopted mother. However, right now I mostly think that Kion was way too busy with his duties to start a real family and that most of his love was for the Pridelands and Laira, so there was almost no place for some lioness in his heart. He fancied Zuri but it wasn't enough to marry her. Yeah but the lion guard members also must have an offspring to be the next lion guard when the old ones will pass away . Breeding a successor is also worth but for the adoption part , still fine . I'm still thinking about that. One day I'm like: yep, Zuri's gonna be Kion's wife, and the other: nope, she's probably not. I ship them too . Kion x Zuri . I wonder if there is a tradition where lionesses will challenge to become the guard leader's mate . They look pretty nice together. Zuri is so elegant lioness, she fits to be Prince's mate a lot. Oh, that would be really interesting to watch! What about Tiffu ? Those chicks are fighting to be Kion's mate . Most lioness doesn't want to have cubs . I'm sure it would be really spectacular to watch Tiffu and Zuri competing to be Kion's mate! i love that art , its a cute heartwarming moment between father and daughter, love it. good work , i hope to see more of kion.